For more take a look at our top 10 list of must have essential oils. 9.5.1 For more take a look at our top 10 list of must have essential oils. The healing benefits of essential oils can be received in three ways. They may be used topically, by applying them directly to the skin. They can be ingested with food or water. Lastly, they can be diffused through the air with the help of an essential oil diffuser. Essential oils should never be used in the eyes or ears, as these membranes are very delicate. Whether the oil is absorbed through the skin, inhaled, or ingested, once it is in the bloodstream, it works therapeutically.. There are many plant products used to extract essential oils. Leaves, stems, flowers, barks, and roots are distilled itno oils by water or steam. Essential oils canbe used in a variety of ways variety of ways they promote mental and physical health, and a whole slew of other things. You can use them to bring balance into a stressful moment, disinfect your home, promote personal health and wellness and improve your skin and hair. Read on to find out more. Inhaling diffused oils is one of the most popular ways to use them. The easiest way is to use a diffuser, specifically designed to maximize the ease and area covered for inhaling or absorbing the oils through your skin. Your favorite oils are added to a diffuser, creating a fine mist of vaouper in the air for you and others to inhale. The wonders of aromatherapy have long been used in spas for their soothing or energizing purposes. To freshen your house overall, take the oil and add a few drops to different places around your house such as the trash can, vacuum cleaner, laundry, drain, balled up in a tissue that you put in a drawer, and anywhere else that seems appropriate. Adding essential oils to your bath will not only make the water fragrant, but it will also help cleanse your skin and helps improve its functioning and beauty. Mix five to seven drops into an ounce of a carrier oil and then pour it into the water as you draw your bath. Essential oils can also be used as a great bug repellent. You put a few drops in some tissue paper, ball it up, and place it around your house. Or use diffuse your oil and spray them around the doors, windows, and corners of your house. Recommend oils for this purpose include- witch hazel, lavender, mint, cedar, and lemongrass. Massages are made better with the use of essential oils. Combine twenty drops with one ounce of a carrier oil, and then rub the mixture into someone’s skin, or have them massage you. Many essential oils have healing properties. Some help to mend abrasions, cuts, and minor wounds. They help prevent infection and assist the living tissues regenerate. Which means faster healing times and fewer complications. Other oils, when diffused, detoxify the air, help fight microbes, help with headaches, respiratory issues, and many more that will be discussed below. The benefits of essential oils are only beginning to be researched, yet humanity has known for a long time just how potent they can be when used correctly. Now that you know a bit more about the oils, lets get into specifics. Some essential oils possess key therapeutic properties best able to relieve depression, insomnia, and anxiety while promoting relaxation. At the top of the list is the ever-popular lavender, due to its ability to restore balance. Other highly popular oils include bergamot, cedar, chamomile, clary sage, geranium, and jasmine. Why not dispense a few drops of one of these aromatics into a hot bath at the end of the day to clear your mind and induce tranquility? Have a headache? Apply peppermint or rosemary to a pulse point or infuse the air around you with their revitalizing scent. It seems that there is an appropriate aromatherapy scent for your every need. If you are looking to alter your mood, achieve a sense of well-being, or relieve minor health conditions, there is a corresponding oil that can help. The flowers of the chamomile plant look like tiny daisies but smell like apples. Grown for many years now because of its various healing properties, chamomile is best known for its calming effects. One of it’s main uses to to help getting a restful night’s sleep. It is also useful for relieving the symptoms of PMS, menopause, and hyperactivity among kids. The oil from chamomile flowers can help ease muscle aches and tensions, headaches and joint pains. With about 300 varieties, eucalyptus has long been a vital ingredient in cough medications because of its scent, which helps open up and clear nasal passages. Eucalyptus has long been a vital ingredient in cough medications because of its tingling scent, which helps open up and clear nasal passages. The effects of eucalyptus on the mind and body include: relief from mental fatigue, improved mental alertness, eased muscle tension and it helps boost the immune system. It is also a widely-used disinfectant and insect repellent. Please note while it is perfect for relieving the symptoms of sinusitis and lung congestion, it is not intended for use during an asthma attack. Lavender has long been associated with cleanliness ever since the Romans first used it as an additive to their bathwater. Today, it is still a favorite for scenting perfumes, soaps, air fresheners, fabric softeners, disinfectants and many other products. Lavender is one of the safest and most widely used essential oils, known to have an uplifting and relaxing effect. If used in large amounts, lavender can be stimulating. It also helps improve digestion, reduce swelling, ease muscle tension and is proven effective for treating minor skin injuries such as burns, cuts, scrapes, and rashes. Peppermint is popular because of its powerful, distinctive mint fragrance. It is a common ingredient in all sorts of products like ice cream, liqueurs, mouthwashes, toothpaste, desserts, cosmetics, household cleaners and much more. Peppermint essential oil is often used in creams to increase blood flow in the body, thus relieving muscle spasms and arthritis. It is also known to improve moods, reduce mental fatigue, sharpen alertness and enhance memory. Known to be able to kill many bacteria and viruses, peppermint is also used for treating ringworm, scabies, and poison oak encounters. With its herbaceous, woody and camphoraceous odor, it is not surprising that rosemary has a wide variety of uses, from the ancient times and continues until today. It became a staple during weddings and funerals in the ancient times. It was used as an ingredient in cosmetics as early as the 14th century. Today it is a popular ingredient in liniments, massage oils and bath products. Rosemary is excellent for improving blood circulation, relieving a sore throat, easing lung congestion, and helps improve digestion. Knowing the benefits and some of the most popular essential oils is great, but it is always helpful to know exactly how to use them. Here is a list of a few ways to put essential oils to work for you and your family to maximize your everyday health benefits. Increase memory and stamina: Drink a glass of water with 2-3 drops of lemon, orange, or peppermint essential oils mixed in. Boost immune system: Apply frankincense, oregano or thyme to the bottom of your foot (3 to 4 drops) after a shower. 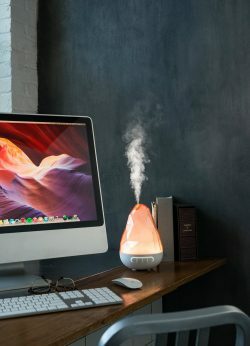 Protect against fungus, bacteria, and microbes: Turn on a diffuser in your home or office, using a specific blend that is protective against microbes. Eliminate an upset stomach: Take a drop or two of cinnamon bark oil in warm water and drink as a tea. Stop headaches: Rub lavender oil on the temples, top of the head, and forehead; lie down for 10 minutes and inhale deeply from the oil left on your hands. Prevent motion sickness: Sprinkle a few drops of ginger or peppermint oil on a tissue and inhale before, or during the car ride. Perfect for kids who love road trips, but get car sick easily. Study aid: To increase concentration and focus, experiment with diffusing one of these essential oils near your study area: lemon, grapefruit, peppermint, bergamot, or pine. Help with insomnia: Place two drops of lavender oil on a tissue and tuck it underneath your pillow. Cure canker sores: Place myrrh on the canker sore for quick healing. Colds and cough: Rub an immune system blend on the chest, back and apply to the bottom of the feet. Note that many oils can be used alone, but are also great together as a blend. No matter how you use essential oils, the most immediate effect will be their aromatic scent you will notice right away. Through the process of distillation, raw plant material undergoes extraction which produces liquid essence, the active ingredients in the essential oil. The conversion process of liquid essence into essential oil does not alter the active ingredients, and when used in aromatherapy, these curative properties can faithfully distribute their benefits positively to affect wellness and equilibrium of the mind, body, and spirit. Closing your eyes, either using an essential oil diffuser, adding your oils to your bath, or however you decide to use them, you can immediately benefit from their calming or revitalizing fragrances. The aromatherapeutic process begins with the sense of smell. Chemoreceptor cells in the nasal area carry the active ingredients to nerve fibers, and by way of impulses, the scent reaches the olfactory bulb in the brain and from there, it travels to the limbic system (center of memory and emotion) where chemicals are released into the nervous system. This entire aromatherapeutic experience happens in a matter of seconds! Also, biochemical responses within the body are happening in the circulatory system, through the lungs when essential oils are inhaled, and the skin when oils are applied topically. The therapeutic properties of essential oils are as numerous as the vast array of plants that sustain us. One of the most popular ways to begin enjoying their benefits is through the method of vaporization provided by an oil diffuser. In these units, water is added along with several drops of a particular oil or a blend of oils. Once the unit is activated, an ultra-fine, scented mist is dispersed into the air by atomization technology a.k.a. Cold air diffusion. This process transforms essential oils into a micro-particle vapor. Cold air diffusion releases beneficial plant compounds for the treatment of depression, anxiety, insomnia and headaches. 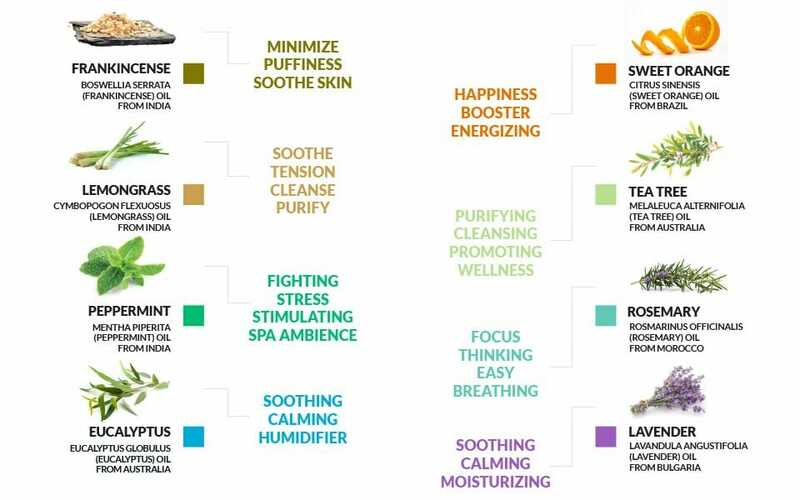 In fact, further research on specific essential oils reveals therapeutic applications unique to each oil. Science and technology work together with the power of aroma to provide a truly therapeutic experience. Incorporating the use of essential oils into your life will raise the quality of your spiritual, emotional and physical experience. These aromatics constitute true flower power in its purest form. Aromatherapy happens in the space of a single breath. Experience the power of scent and alter your present moment. When you start looking to buy essential oils, you will find that there can be large differences in prices. This is because there can be a huge difference in the quality of the essential oils. Be very careful that you are not fooled! Because there are almost no legal standards for essential oil ingredients, anything can be labeled as an essential oil. 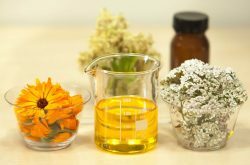 Many of the cheaper options use manufactures that destroy most of the living plant compounds, when processing, making those oils for the most part worthless for any therapeutic uses. It is worth taking a little extra time to really make sure you’re spending your money on what you want. Manufacturers can cut their essential oils up to 48% with a cheaper oil and still call it “pure.” If I found this out about my oils, I sure would not be happy. Brush up on what to look for and our top 10 recommended essential oils brands. Be sure you know what to look for when purchasing your oils. You’ll want to check labels, look for dark colored bottles, if any additives were mixed in, and research if their producer company is known for quality. Different priced oils might smell the same and look the same, but you will find that they have very little, if any, potency. If you have tried essential oils before and found they didn’t do anything, you most likely used some of these cheaply produced oils, and that is why they were ineffective. It is true that good therapeutic oils will cost you more. But a cheap oil didn’t save you any money if it doesn’t give you any results. Genuine therapeutic essential oils will have the amazing restorative and health-giving properties of the plant in a concentrated form, so don’t compromise your health for a few dollars savings.